Introduction: Bite marks are often observed at crime scenes on various parts of the human body. Bite marks have also been observed on various edible leftovers at the crime scenes which were used as evidence for identifying the criminals. Objective: The objective of the study is to compare the accuracy of bite marks on an inanimate substance (fruit) and a living tissue (skin) using digital analysis. Materials and Methods: A cross-sectional study was conducted involving 25 volunteers. The registered bites of individuals on inanimate object (fruit) and living tissue (skin of forearm) were photographed with the American Board of Forensic Odontology scale No. 2 in the view field immediately after the production of bite marks. Dental casts of the individuals were obtained and photographed out of which computer-assisted overlays were generated, and analysis was carried out digitally using Adobe Photoshop version developed by Adobe Systems. Statistical analysis was performed using IBM SPSS software, version 22 and Chi-square test. Results: Skin had a comparable accuracy to that of an inanimate object which is statistically attested. Conclusion: The source of bite marks, the substrate onto which they are generated and the technique of lifting the bite imprints serve as important tools in analysis. One of the physical and/or biological evidence left by the criminals at the site of act is the bite marks. The dictionary definition of the verb to “bite” is to “tear” or “seize” with the teeth. In forensic sense, the term is used more broadly, and it is suggested that a suitable definition of a bite mark is “a mark caused by mouthparts.” It is considered as a pattern produced by human or animal dentition and associated structures in any substance capable of being marked by those means, as defined by Clark. Identification by teeth is not a new technique. It dates back as far as 66 AD at the times of Nero. Before 1950, the number of cases where bite marks were used as evidence was small as compared to today. Sorup was the first to publish an analysis of bite marks. Human bite marks are found when teeth are used as weapons. It can be found in food, flesh, cigars, pipes, and musical instruments. According to Pretty and Turnbull, the central dogma of bite mark analysis is based on two assumptions. The first is that human teeth are unique, and the second is that sufficient detail of the uniqueness is rendered during the biting process to enable identification. Various experimental studies have been conducted on various food items, human skin, and animal skin to determine similarities and dissimilarities of the bite marks and the teeth of the volunteers. Skins of dogs, pigs, and sheep have been used to study bite marks. Bite marks are lifted using various photography techniques and other materials. According to West et al., photographs of bite marks should be obtained as early as possible because of changes due to vital reactions. According to McNamee and Sweet, the use of digital cameras has the advantage that it could provide instant preview and does not require scanning of the photographs. Reflected ultraviolet imaging techniques may be the future of recording of evidence and may be used for bite marks, as well. This study aims at the evaluation of the bite marks for analysis on a living tissue like skin and an inanimate object like fruit. The objective of the study being the appraisal of the accuracy of registered bite marks on respective substrates using digital analysis. Twenty-five volunteers participated in the study and informed consent was obtained. The individuals participating in the study were asked to bite on an inanimate substance such as fruit with a pressure sufficient for the bite imprints to be generated with a care that the food substance (fruit) is not sheared. The bite marks thus imprinted on the surface of fruit were recorded using iSight 8 megapixel camera in visible light wavelength immediately with a care that the registered bite marks were neither distorted nor deteriorated placing the American Board of Forensic Odontology (ABFO) scale No. 2 in the view field immediately after the production of bite marks to generate life-size images for analysis. The volunteers were then made to bite on their forearm after disinfecting the site. The registered bites were photographed in a similar procedure placing ABFO scale No. 2 in the view field immediately after the production of bite marks. Dental casts of the individuals were obtained using alginate impression material and dental stone. They were photographed and all the life-size images were collected with the reference scale in the field of view. The images were captured at a distance of about 10 cm from the registered bite and the dental casts. The images were then subjected for digital analysis using Adobe Photoshop (Version 7), developed by Adobe Systems by generating overlays using the tracing tool on all the incisal edges of the anterior teeth on dental casts and registered bite imprints. The overlays obtained from bite marks on living tissue (hand) and the inanimate object (the fruit) were compared individually with the overlays of dental casts by superimposition method. When the overlays of incisal edges and cuspal tips of all the anterior teeth were apparently superimposed on to the ones generated from bite mark overlays with the alignment of each tooth and anterior arch as a whole, a Grade A was given. When the overlays were comparatively superimposed but not accurate in terms of alignment, a Grade B was assigned. No single tooth in an arch among the registered teeth in a bite mark overlay is superimposed onto the ones on dental cast; a Grade C was allocated. The grades obtained separately on living tissue and an inanimate object were compared for the accuracy of the objects for bite marks production and their analysis. The collected data were analyzed with IBM SPSS statistics software 22.0 Version (Armonk, NY: IBM Corp). To describe the data descriptive statistics frequency analysis, percentage analysis was used. To find the significance in categorical data, Chi-square test was used. In the above statistical tools, the P < 0.05 is considered as significant level. 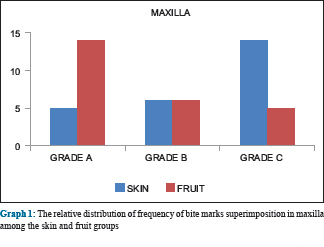 In the present study, evaluation of the maxillary bite imprints on skin asserts that the percentage of overlays with Grade A superimposition was 20%, Grade B accounts to be 24%, and Grade C was found to be 56% [Table 1], whereas on fruit (inanimate object), the percentage of overlays with Grade A superimposition was 56%, with Grade B the percentage was 24%, and Grade C accounted to be 20% [Table 2]. The relative frequency of superimpositions among two groups, namely, skin and fruit was clinically depicted in [Graph 1]. 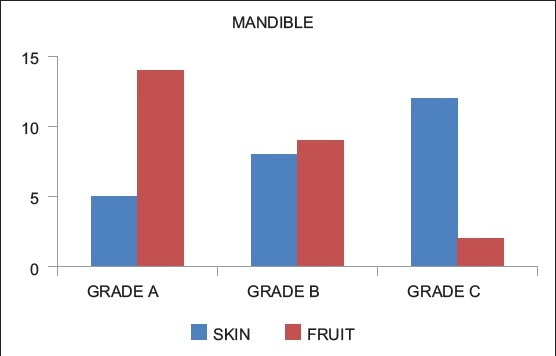 Evaluation of the mandibular bite imprints on skin asserts that the percentage of overlays with Grade A superimposition was 20%, Grade B accounts to be 32%, and Grade C was found to be 48% [Table 3], whereas on fruit (inanimate object), the percentage of overlays with Grade A superimposition was 56%, with Grade B the percentage was 36%, and Grade C accounted to be 8% [Table 4]. The relative frequency of superimpositions among two groups, namely, skin and fruit is depicted in [Graph 2]. Although clinically, the percentage of distribution asserts that the fruit has a better accuracy in registration and analysis of bite marks, the statistical analysis was not in accordance with the same (P > 0.05). A bite mark has been defined as “a pattern produced by human or animal dentitions and associated structures in any substance capable of being marked by these means.” The physical characteristics of bite mark which contributes to its eccentricity include the shape of the dental arch, distance between the canines, presence of a tooth out of alignment, spacing between teeth, rotation of teeth, missing teeth, the curves of biting edges and the wear patterns. Hence, the conjecture of bite mark analysis is that human dentition is inimitable and that this affirmed uniqueness is replicated on the bitten substrate in sufficient detail to enable a match to the individual under suspicion. Bite mark analysis and comparison is a complicated perspective. The standard techniques for examining bite marks are based on interpreting photographic evidence, in which a bite is compared with the models of the teeth of suspects. The quality and angle of the bite mark photographs and the precision of the impression of the suspect's dentition are of extreme importance to the forensic odontologist. Bite marks may disclose individual tooth imprints. They may appear as a double-arched pattern or even a homogeneous bruise. Bite marks can be distorted by the elastic properties of the skin tissue or by the anatomic location. Furthermore, the pressure of the bite and the angle of the maxilla and mandible can change the appearance of a bite mark. The position of the body at the time the bite was inflicted may also play a part. The forensic value of bite marks on foodstuffs depends on the nature of the substrate and the ability of the perishable food substance to dehydrate and deform at room temperature, the precision of impression of the suspect's dentition on the foodstuff and the time elapse in collecting and preserving the bite mark evidence. There are a number of different ways to produce overlays from a suspect's dentition: Hand tracing from dental study casts, hand tracing from wax impressions, hand tracing from xerographic images, the radiopaque wax impression method, and the computer-based method. Historically, the manual method was the only method known for generating overlays and was used first in about 1966. Dailey (1991) presented a quick, inexpensive, and accurate technique for generating transparent overlays, using office photocopy machines, for use in bite mark case analysis. Naru and Dykes (1996) introduced the computer assisted overlay generation method to forensic odontology. Sweet et al. (1995) in their study compared five different methods of overlay generation. The computer-based production method was determined to be the most accurate of those studied. It produced accurate representations of the biting edges of the teeth in an objective manner. In the present study, the overlays were generated from biting edges on the casts and from the bite imprints on the living tissue and an inanimate object using tracing tool in Adobe Photoshop software version 7.0. The overlays obtained were then analyzed by superimposition technique (subjective method) and graded based on the degree of superimposition into Grade A, B, and C for totally superimposing overlays, moderately superimposed overlays, and no superimposition, respectively. The results of the study affirm that among the two groups under study, that is, the living tissue (skin of forearm) and an inanimate substance (fruit), the percentage of totally superimposed maxillary overlays was found to be 56% on an inanimate substance, whereas it is 20% on the skin. The moderately superimposed overlays in both the groups account to be 24%. In the mandible, the count was found to be 56% on fruit and 20% on the skin. The percentage of moderately superimposed overlays on fruit was 36%, and on skin, it was 32%. The percentage of overlays with no superimposition in maxilla accounts to be 56% and 20% on skin and fruit, respectively. Whereas in the mandible, 48% of total overlays were under category of nonsuperimposing within the skin group, and this count was 8% within the fruit group. Although the percentage of the totally superimposed overlays in the maxilla and mandible among the groups depicts that the fruit (inanimate object) is better in accuracy for evaluation and analysis of bite marks than the skin, the statistical significance was found to be negligible (P > 0.05). Hence, the study results statistically delineate that the skin has an accuracy which is comparable to that of an inert object which is in accordance with a study conducted by Gorea et al. (2007) with a 60% match of individuals from skin overlays. Whittaker (1975) reported that matching of the bite marks on animal skin corresponded in only 76% of the cases. Human tissue has been described as one of the least dependable substances for recording bite marks. This was not in total conformity with the present study which could be attributed to a relatively lower sample size and that there was barely a time lapse between the registration of obtained bite imprints which is a factor to be considered in the process of evidence collection during crime investigations. The percentage of nonsuperimposed overlays on the fruit in maxilla was 20% and on mandible 8%. Although stated in the study by Gorea and Jasuja et al. that exanimate object like clay has a better accuracy, this imprecision of mandibular overlays on fruit can be attributed to the fact that the quality of bite imprint is not only determined by the type and consistency of the substrate but also the biting process as a whole. The variability in the degree of superimpositions among maxillary and mandibular bite imprints can be attributed to the bite mechanism which is when the teeth apply pressure on the substrate with a varied force. It begins with closure of mandible, followed by a negative pressure from the suction of skin or any other substrate, and the tongue thrust from the opposite direction; therefore, there would be projection of teeth edges and palatal surfaces. However, in our study, patterns from other mouthparts or alterations in the bite patterns due to the pressure from other mouthparts was not perceived since all the participants were elucidated the kind of bite imprints appropriate for their analysis and the agendum was subjective. When an individual bites something, the superior teeth stabilize the object, while the inferior teeth try to cut it. The indentation created by the superior teeth is significantly important to obtain information such as dental alignment, size, and shape of dentition. The factors which influenced the accuracy of bite mark analysis in our study were physical nature of the foodstuff, the biting force with which bite mark was done. The time lapse in collection of the imprints was negligible which serves as an important factor when perishable substances are used for bite mark analysis. Furthermore, it was stated in previous studies that photography, the method chosen for overlay production and the individual expertise in the analysis play a key role in the assertion of reliability on an object for bite mark analysis in a given forensic happening. The importance of bite marks and their analysis in forensics is well asserted. The source of bite marks from which they are produced, the substrate onto which they are generated and the technique of lifting the bite imprints serve as important tools in analysis and identification. Although inanimate objects serve as a better sources for analyzing bite marks, when collected immediately with an appropriate technique skin has an equivalent accuracy in bite mark analysis. This ambiguity in the substrates' accuracy in our study nevertheless is a statistical attestation which can be accredited to various physical characteristics of the substrate and mechanical idiosyncrasy involved in the phenomenon of biting. However, further extensive research within a population is necessary for an exceeding affirmation. Duckett B. Concise Oxford English Dictionary (11th edition), Reference Reviews. Emerald Group Publishing Limited 2005 Vol. 19. p. 435. MacDonald DG. Bite mark recognition and interpretation. J Forensic Sci Soc 1974;14:229-33. Clark DH. Practical Forensic Odontology. Oxford: Wright Publishers; 1992. Verma AK, Kumar S, Bhattacharya S. Identification of a person with the help of bite mark analysis. J Oral Biol Craniofac Res 2013;3:88-91. Sorup A. Odontoskopie. Ein Zahnirzhlicher Beitrag Zur Gerichtillichen Med 1924;40:385. Gorea RK, Jasuja OP, Abuderman AA, Gorea A. Bite marks on skin and clay: A comparative analysis. Egyptian Journal of Forensic Sciences 2014;4:124-8. Pretty IA, Turnbull MD. Lack of dental uniqueness between two bite mark suspects. J Forensic Sci 2001;46:1487-91. Whittaker DK. Some laboratory studies on the accuracy of bite mark comparison. Int Dent J 1975;25:166-71. West MH, Billings JD, Frair J. Ultraviolet photography: Bite marks on human skin and suggested technique for the exposure and development of reflective ultraviolet photography. J Forensic Sci 1987;32:1204-13. McNamee AH, Sweet D. Adherence of forensic odontologists to the ABFO guidelines for victim evidence collection. J Forensic Sci 2003;48:382-5. Garcia JE, Wilksch PA, Spring G, Philp P, Dyer A. Characterization of digital cameras for reflected ultraviolet photography; Implications for qualitative and quantitative image analysis during forensic examination. J Forensic Sci 2014;59:117-22. Gorea RK, Jasuja OP, Aggarwal AD, Narula R. Revenge by the bites. J Ind Acad Forensic Med 2007;29:17-20. Daniel MJ, Pazhani A. Accuracy of bite mark analysis from food substances: A comparative study. J Forensic Dent Sci 2015;7:222-6. Committee on Identifying the Needs of the Forensic Sciences Community. National Research Council. Strengthening Forensic Science in the United States: A Path Forward. Washington, DC: National Academics Press; 2009. Tai MW, Chong ZF, Asif MK, Rahmat RA, Nambiar P. A comparative study between xerographic, computer-assisted overlay generation and animated-superimposition methods in bite mark analyses. Leg Med (Tokyo) 2016;22:42-8. Beckstead JW, Rawson RD, Giles WS. Review of bite mark evidence. J Am Dent Assoc 1979;99:69-74. Vale GL. Dentistry, bite marks and the investigation of crime. J Calif Dent Assoc 1996;24:29-34.